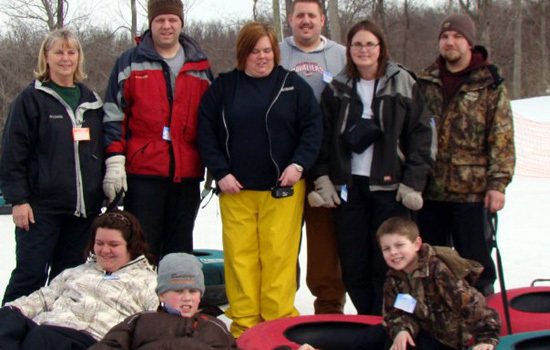 Today Crissy, Derek, Jake, Jenny, Amy, Matt, Zander, Sarah and I went to Mad River Mountain Ski Resort to go snow tubing. We arrived at about 11:30am, after the two-hour drive. We all change into our warmest clothes in the parking lot before getting our 3 hour tubing passes. The temperatures were in the mid 30's with no wind at all and a bright overcast sky. There was a large crowd, but not unmanageable for the most part. There was a large crowd at the top of the tubing chutes around 2:00pm, but by the time we left at 2:30 it had thinned out some. I think all of us hit each of the ten chutes and no one crashed. We all had fun and got a good workout too. we had the most fun when we woudl go down the hill in a large group. Jenny, Me, Crissy, Derek, Amy and Matt. On the way back to Nelsonville, we stopped and had a hot meal at Bob Evans in Marysville. I just had to get some hot tea and chicken-and-noodles.